I still can't believe that as I'm typing this post it's the last day of 2014. Where did the time go?! If you've missed my 2014 round up posts this past week you can check them out here and here. I've loved 2014 but also i've not been a big fan of 2014 but time to focus on the positives right? I flew to the otherside of the world by myself, visited New Zealand and Australia, Passed my driving test and started a new degree are my favourite highlights of the year! But onto my other highlights, outfit posts which were my favourites from the year, so here we go for round 2! 2014 was definitely the year that my obsession for striped tops grew and grew. This striped top from ASOS (sold out but similar one here) I wear all the time at the moment! It goes perfectly with high-waisted skirts, trousers, disco pants and jeans. I really like how versatile striped tops are and how they never go out of fashion! You can check out the full outfit post here. This black polo neck I bought over a year ago and have worn literally about 50 times. It's the perfect high-waisted jeans sort of crop top and I wear this all the time for university. 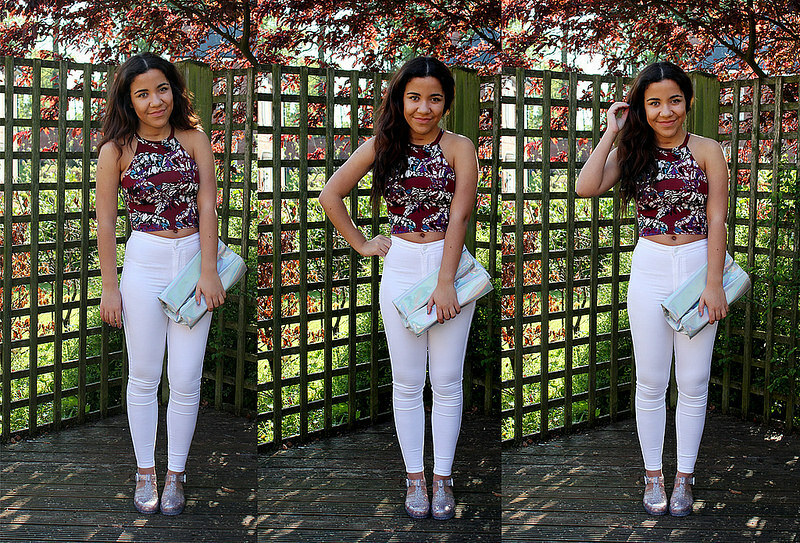 (You can check out the top here) I love this outfit with the daisy print trousers. I think it looks really chic and classy especially with the red lipstick (good old ruby woo!) you can check out the full outfit post here. These floral jeans were on of my favourite purchases I've made all year. I have had so so many compliments on them and I absolutely love the print of them! I've worn them all summer and on so many nights out. You can check out the full post here. 2014 was definitely a lovely summer, the heat wave we had for a few weeks was amazing! I remember wearing this playsuit on such a lovely sunny day and felt so summery! You can check out the full post here. This year was definitely a year of high-waisted jean loving! I remember lusting after this pair of white joni jeans and I really don't regret buying them! They look amazing all year round, especially with a striped top and ankle boots! This outfit was definitely a more summery look (hence the jelly shoes) you can check out the full outfit post here. Wow, these outfits are SOO gorgeous! Love them! This is a really good post!